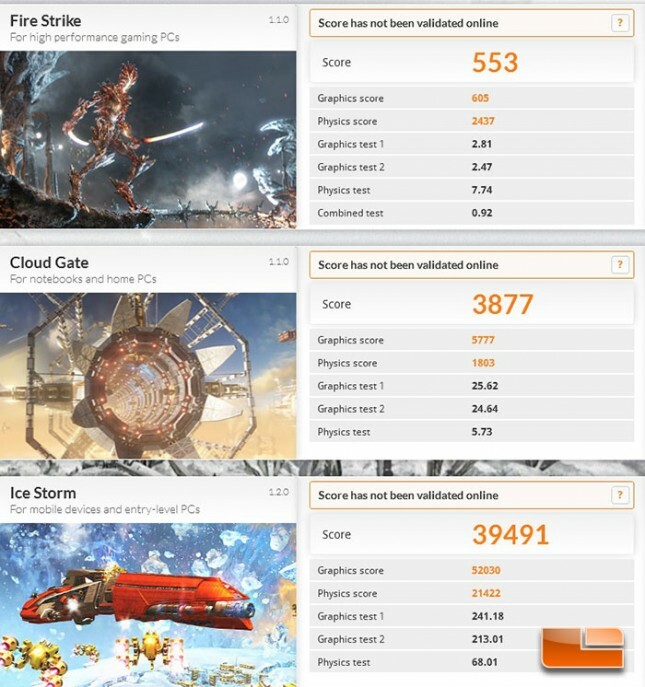 I’m not surprised that the GIGABYTE Brix didn’t exactly break any records in the latest iteration of Futuremark 3DMark. It’s not meant to, but it certainly held it’s own scoring a respectable score of 39491 in the Ice Storm benchmark and a score of 3877 in Cloud Gate. 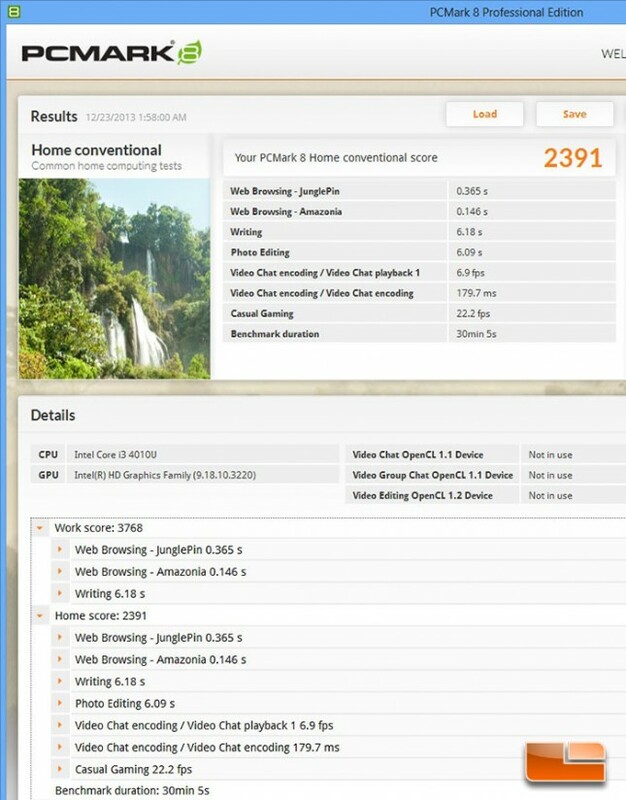 In PCMark 8 the GIGABYTE Brix scored 2391 overall with a casual gaming score of 22.2 frames per second. I wouldn’t rely on the Brix to rock the latest games like Battlefield 4, but it’ll play a few games with the eye candy turned off when you need your fix. 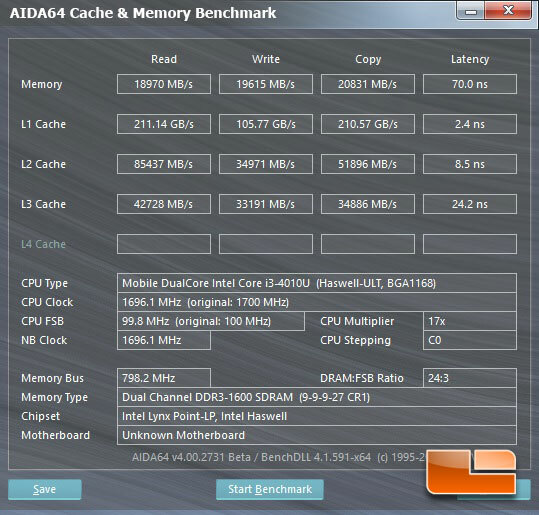 The GIGABYTE Brix uSFF PC was able to hit 18970MB/s read speed and 19615MB/s write speed in the AIDA64 memory benchmark. 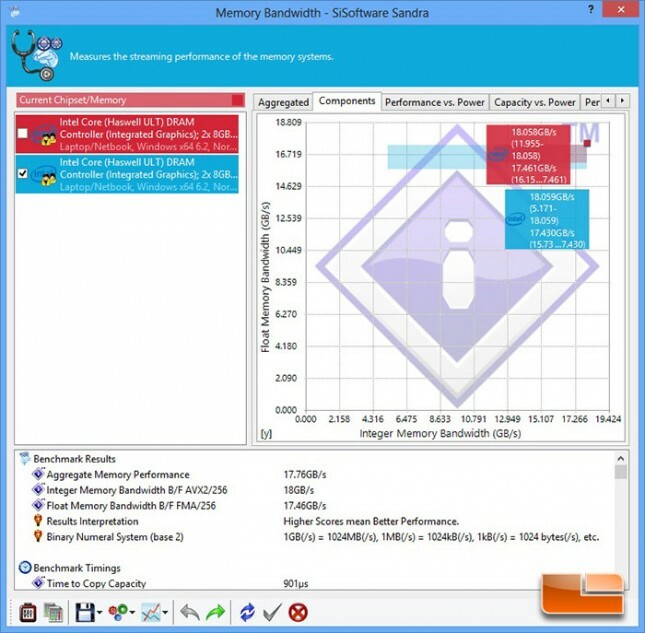 The GIGABYTE Brix and our Kingston HyperX memory were able to hit an aggregate memory bandwidth performance of 17.76GB/s in SiSoftware Sandra 2014. In the Sandra Arithmetic benchmark the GIGABYTE Brix hit an aggregate native performance of 26.15 GOPS. The Processor Multi-Media test in Sandra showed an aggregate Multi-Media Native Performance of 74.25MPix/s. The Sandra processor Cryptographic bandwidth of 1.9GB/s. 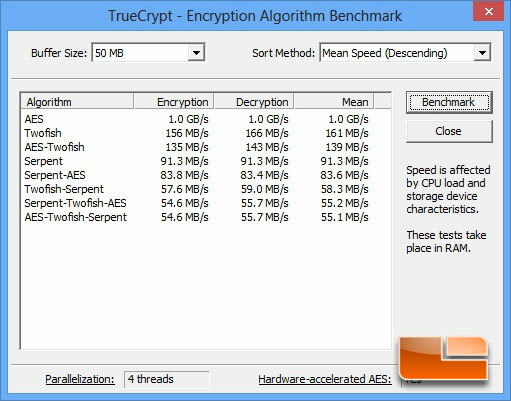 The benchmark within the TrueCrypt software showed the GIGABYTE Brix uSFF PC had a AES mean score of 1.0GB/s. 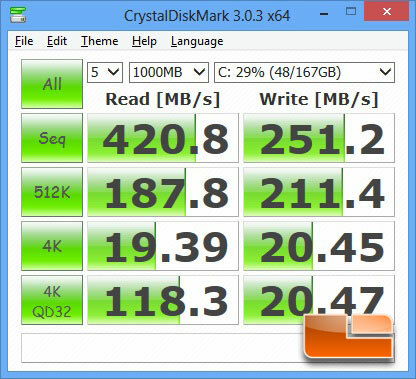 Giving the latest version of CrystalDiskMark 3.0.3 a quick run I found that there was plenty of speed when it’s coupled with the Intel SSD 530 Series that came out a few months ago. The Sequential read was cruising along at 420.8MB/s while the sequential write was hitting 251.2MB/s. Looking at the 4K random speeds the read hit 19.39MB/s and the write hit 20.45MB/s. Overall the Intel SSD 530 180GB mSATA drive and the GIGABYTE Brix is a great team. Curious about the network performance of the GIGABYTE BXPi3-4010 I fired up LAN Speed Test. Using the office desktop as our server via a Gigabit wired connection through our ASUS RT-AC660 router I ran tests on both the wired and WiFi. The first test above is the wired connection running 50 100MB packets. The average write/upload speed was solid at 875.054Mbps while the average reading/download was a hair faster at 879.514Mbps. This test we still ran 50 packets though we reduced the size to 1Mb. We picked up a little bit of speed with the smaller packets. 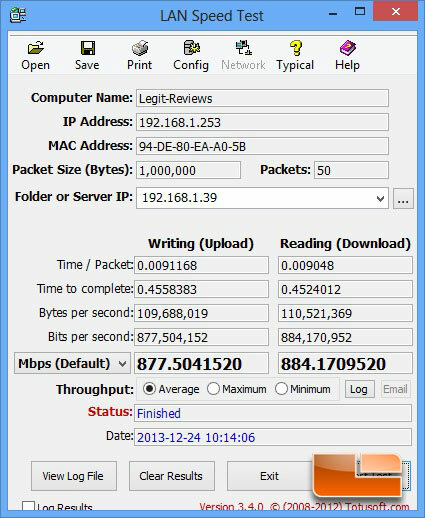 The writing/upload speed jumped ~2.5Mbps to 877.504Mbs and the average reading/download speed jumped to 884.171Mbps. Firing up the GIGABYTE WiFi module within the BXPi3-4010 the average writing/upload hit 45.025Mbps while the reading/download hit 45.984Mbps. Dropping the packet size down to 1Mb we were able to pick up a little bit of speed on the upload, increasing to 49.804Mbps, though our download dropped a hair to 44.578Mbps. The Intel Core i3-4010U processor isn’t meant for raw power, but it’s able to get the job done well enough in the GIGABYTE Brix PC & Projector. 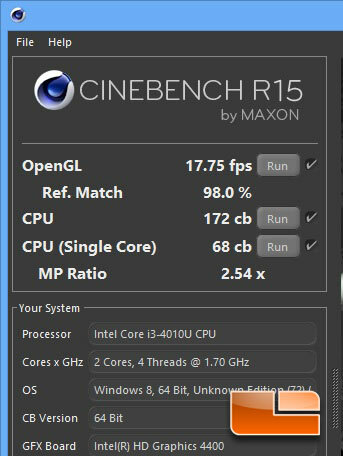 In Cinebench R15 the Brix was able to hit 172cb across all cores and 68cb across a single core which isn’t to shabby from a dual core/four thread processor.